2012, DV Pal, 6 min. The documentation of misery holds no inherent political act, and compassion doesn’t call any economic, political or social conditions into question. However, it is precisely these conditions that are written in the body, inscribed as a narrative, which nevertheless is never told. If the body is shaped by our own history and experience, then our bodies don’t have much in common. In that case, we should not use, when we tell each other stories in images, the body as a common basis or origin. The similarities and commonalities, the codes and conditionings, always just follow a narrative of power. Language rests upon a basis that we tell each other as commonness. 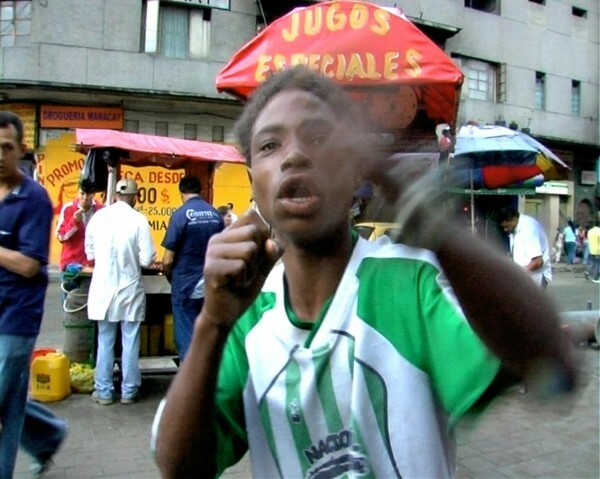 But when the teenage prostitutes living on the streets of Medellín begin to rap because someone with a camera is present, it doesn’t tell us anything about their lives. It is not about a common expression, understandable for everyone, but about a narrative of social romantic glorification that we tell each other in images about ourselves. Instead, one should be able to read the bodies in these images. After all, they do tell another narrative, unlike language; namely a narrative about differences. It is not on commonness or similarity, but on differences that the reading of images and bodies, and also language, should be based on. Only then could we learn what they really show and tell. Xavier cuts right to the chase of this dilemma. Xavier who raps, even though he is so called "deaf-mute".